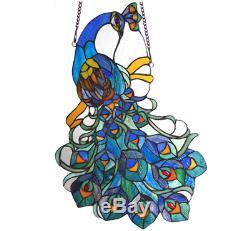 Tiffany Style Peacock Design Window Panel/Suncatcher. Captivate and enchant with this handcrafted Tiffany-style window panel. 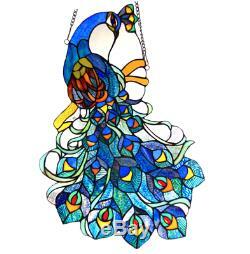 Handcrafted from individually hand-cut pieces of art glass, this suncatcher in a peacock design boasts shades of blue, red, and yellow. 25 inches high x 17 inches wide x 0.25 inches deep. We consider it a top priority that our customers are happy and in the rare event that they are not, we do everything we can to fix the situation. No customer will walk away from our store unhappy. If there's a problem, whether an order arrived damaged, late, or simply because you had a change of heart just let us know right away and we will work with you to make sure your business with us is to your satisfaction! When returning an item, it must be in all of the original packaging and include all of the original accessories or items that came with it. We do our best to process as quickly as possible. 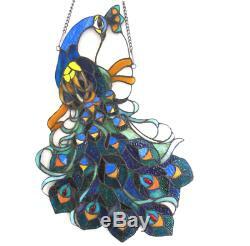 The item "Stained Glass Peacock Design Window Panel Tiffany Style Hanging Home Decor Blue" is in sale since Monday, October 2, 2017.